For local composer and pianist Wayne Horvitz, many roads have led to this milestone: the world premiere of Those Who Remain, a concerto featuring guitarist Bill Frisell, presented by the Seattle Symphony on its Sonic Evolution concert on October 29. With a musical style that defies labels of “jazz” or “classical,” and after decades of a globetrotting career that blurs boundaries between composing and improvising, the defining trait of Horvitz’s latest music is its deep roots in this land that he has made his home. Born in New York City, Horvitz developed an early love of the West, traveling widely by car and by foot on family trips. He enrolled at the University of California, Santa Cruz, and his wanderlust led him to hitchhike and backpack around the Pacific Northwest. In the 1980s Zorn developed a worldwide following for his genre-bending band, Naked City. Along with Horvitz on keyboards, the all-star group featured guitarist Bill Frisell, bass guitarist Fred Frith and drummer Joey Baron. When they weren’t touring together, three of the members — Horvitz, Frisell and Baron — were at that point neighbors in Hoboken, New Jersey, across the river from Manhattan. Horvitz and his wife, composer-singer Robin Holcomb, eventually wanted more space to raise a family, so they moved to Seattle in 1988 with their young daughter. Frisell and his family came for a summer visit, and they too were charmed by the Emerald City, prompting them to make the same move West. Meanwhile, Horvitz has undergone a musical migration of his own. When he moved to Seattle, he was primarily touring and performing in jazz clubs, as well as producing albums for Frisell and others. Lately, he has been increasingly drawn to projects that are more “classical” in nature, composing fully notated scores for conservatory-trained musicians. Since 1999 he has written string quartets, an oratorio and works for chamber orchestra. Those Who Remain is his first large-scale concerto, and it combines written material for the orchestra with a guitar part for Frisell that specifies exactly one note, the rest being improvised. To immerse himself in Hugo’s world, Horvitz went on a road trip through Montana, and he even stayed in the cabin frequented by Hugo and other writers. Most of Those Who Remain was composed during Horvitz’s residency at the Ucross Foundation in Wyoming, just miles from the town of Ten Sleep, referenced in the Hugo poem Three Stops to Ten Sleep — which Horvitz adopted as the title of his first movement. Lawrence, Jacob (1917–2000) © ARS, NY. The railroad stations were at times so over-packed with people leaving that special guards had to be called in to keep order. 1940–41. Panel 12 from The Migration Series. Tempera on gesso on composition board, 12 x 18" (30.5 x 45.7 cm). Gift of Mrs. David M. Levy. Reproduction, including downloading of Jacob Lawrence works is prohibited by copyright laws and international conventions without the express written permission of Artists Rights Society (ARS), New York. In the last century, those opportunities led millions of African Americans to leave the rural South in what has been dubbed the “Great Migration.” They flocked to northern and western cities including Seattle, which saw its African American population quadruple between 1940 and 1950. The African American artist Jacob Lawrence was just 23 when he created his immortal Migration Series, a set of 60 panels telling the story of the ongoing Great Migration. Later Lawrence made his own westward transit, when he joined the faculty of the University of Washington, and he lived in Seattle until his death in 2000. Composer Derek Bermel paid tribute to Lawrence with the 2006 composition Migration Series, a concerto for orchestra and jazz band, commissioned by the American Composers Orchestra and the Lincoln Center Jazz Orchestra, led by Wynton Marsalis. Bermel is also a clarinetist and improviser, and his score sizzles with authentic jazz licks and rhythms. The wealth of local talent is no surprise to Seattleites, who do so much to support and nurture creative artists within the community. The Seattle-born singer Shaprece is a prime example, with her blend of classic soul and sizzling electronica. Her sophisticated songs already play like miniature symphonies, and they will reach new sonic dimensions in original arrangements for orchestra. 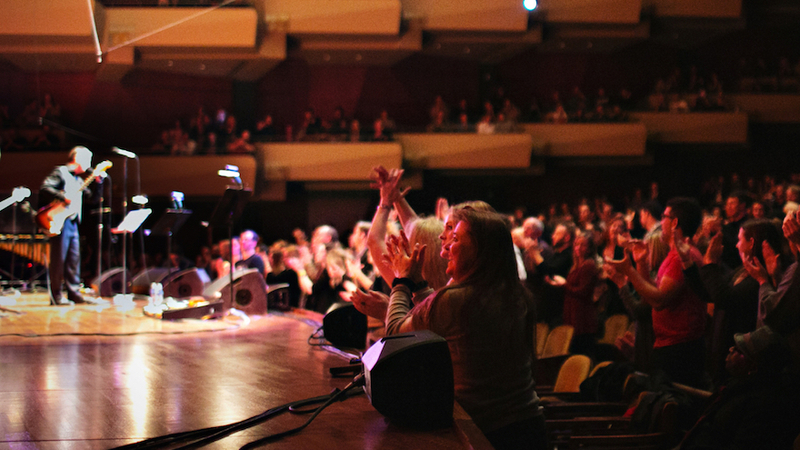 The driving motive for the Seattle Symphony’s Sonic Evolution series is to bring composers into dialogue with Seattle’s rich creative tradition, whether the inspiration comes from huge stars like Jimi Hendrix and Kurt Cobain (as in past seasons) or cherished local artists like Richard Hugo and Jacob Lawrence. Horvitz and Shaprece represent two essential points on Seattle’s current musical map, and they are blazing paths for a new generation that is already in motion.